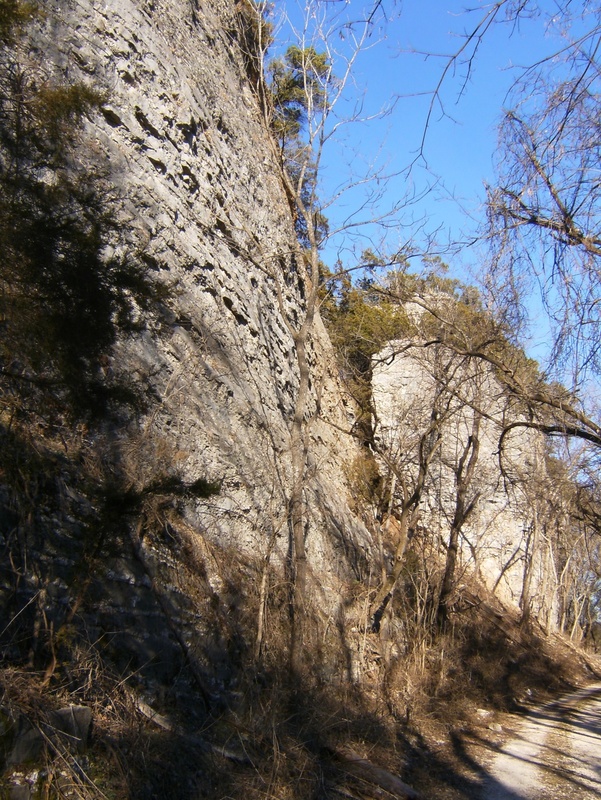 I planned it as a 3 day trip but I managed it in 2 – hiking from the FR 1201 trail head to the Buffalo River at the Wollum Ford (maps 16 & 17) yesterday and hiking back today – a 26.5 mile round trip. 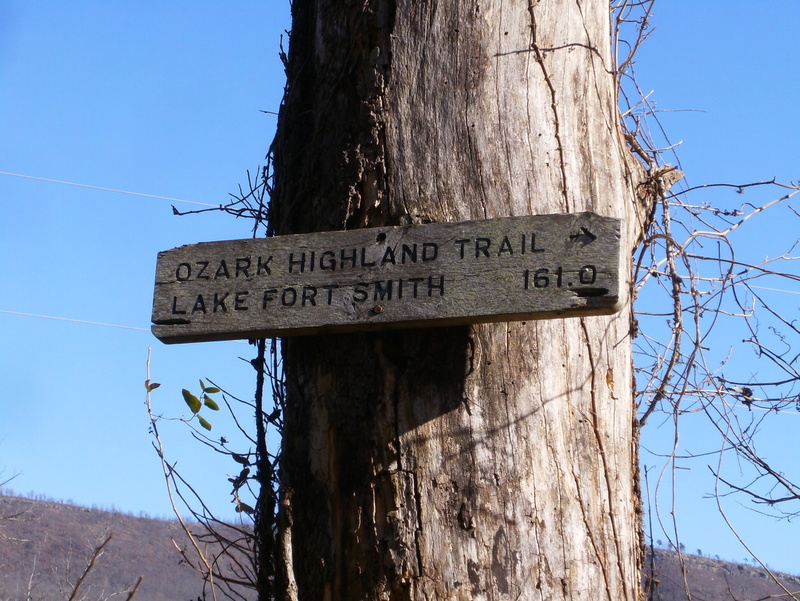 My arrival at the Buffalo also marked the completion of my first section-hike of the 165-mile Ozark Highlands Trail. 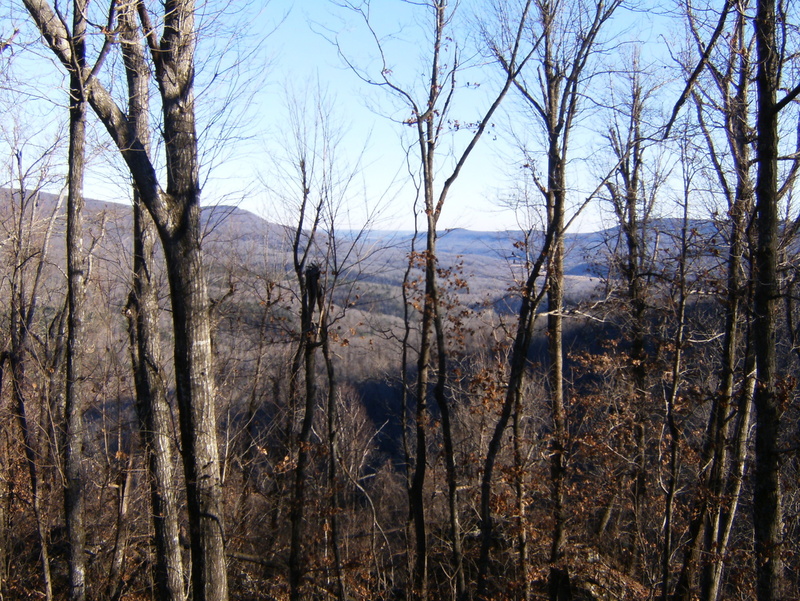 I hiked 5 of the 8 sections this season (since fall 2013) and 6 in the last calendar year. 4 sections were done solo. I drove to the trail head early Friday morning. It was 9 degrees when I hit the trail and I was very glad I wasn’t camping that night. The sky was clear and it warmed quickly but never got over 40 and was below freezing again by the time I set up camp. It actually warmed overnight – back up to 40 when I got out of bed Saturday with a high later of 55. This part of trail starts off headed down hill along a creek and then turns east around the end of the hill through a large rock garden. 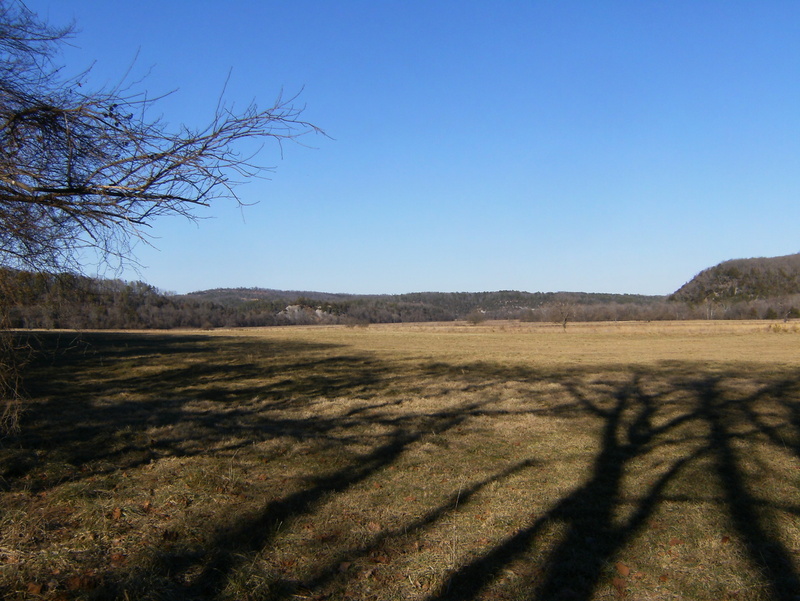 Here you can catch your first glimpse of the destination – the Richland Valley with the Buffalo River somewhere beyond. The trail continues fairly level for awhile up the Dry Creek drainage before dropping steeply and crossing. 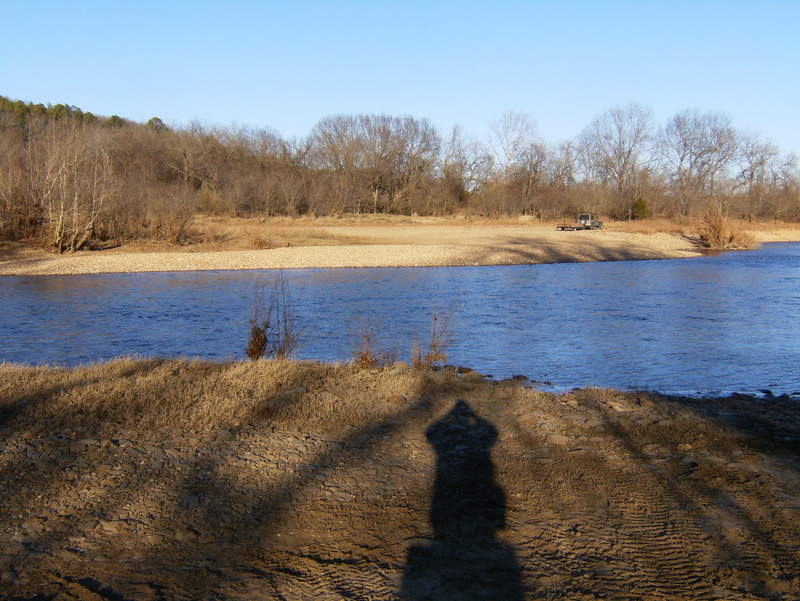 Dry Creek wasn’t dry – in fact, it looks like it may have water much of the year. I wonder if the early settlers named it for the same reason the Vikings named one of their territories Iceland. 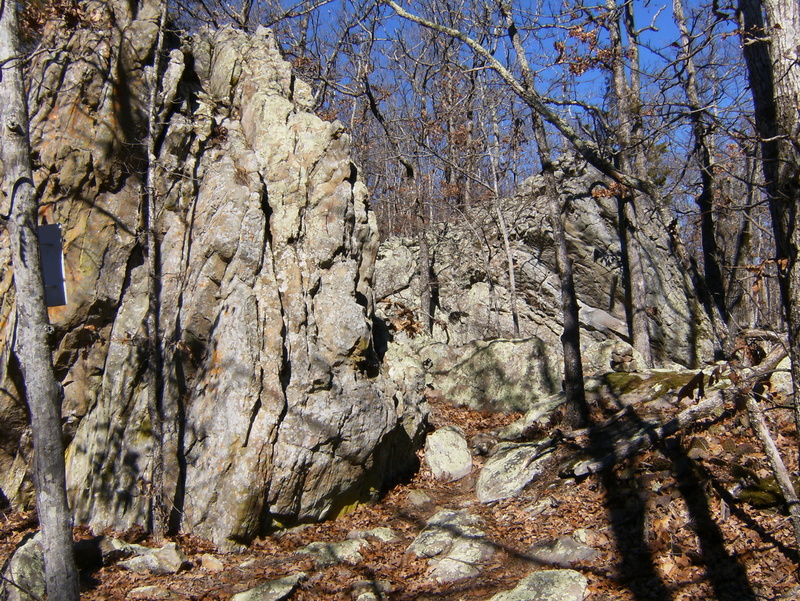 The trial turns north across Lawyer Hollow, Winding Stair Hollow, Cedar Hollow, and Leaning Rock Hollow over the next 4.5 miles. All had water and a couple – I’ve already forgotten which – were the kind of place that would be really cool to explore after a big rain. Even several drainages too minor to be noted on the maps had water so I was able to avoid carrying much. 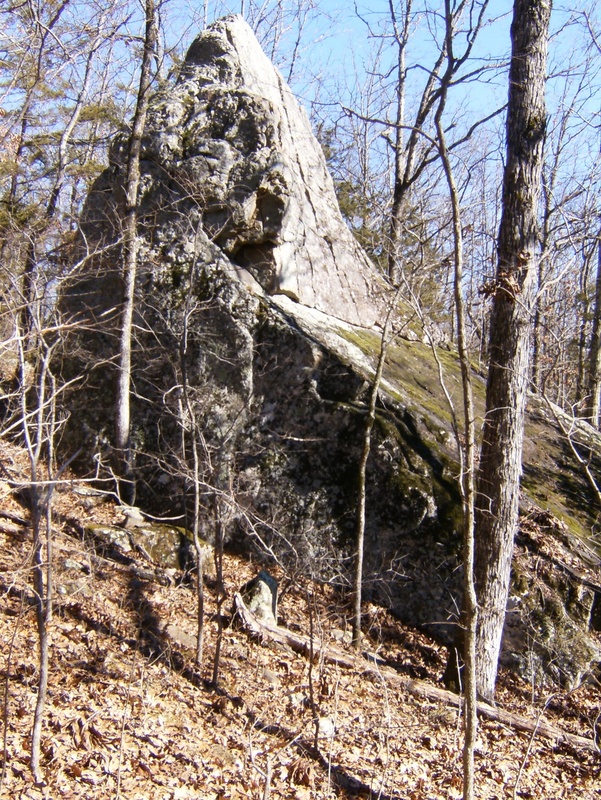 After Leaning Rock Hollow, the trail starts its long descent toward the Richland Valley and soon joins an old logging/wagon road for a couple miles – easy walking – before dropping steeply down a hill, out of the woods, and ending at North Richland Road (mile 161) – one of the more inaccessible roads (for vehicles) in Arkansas, I’ll bet. 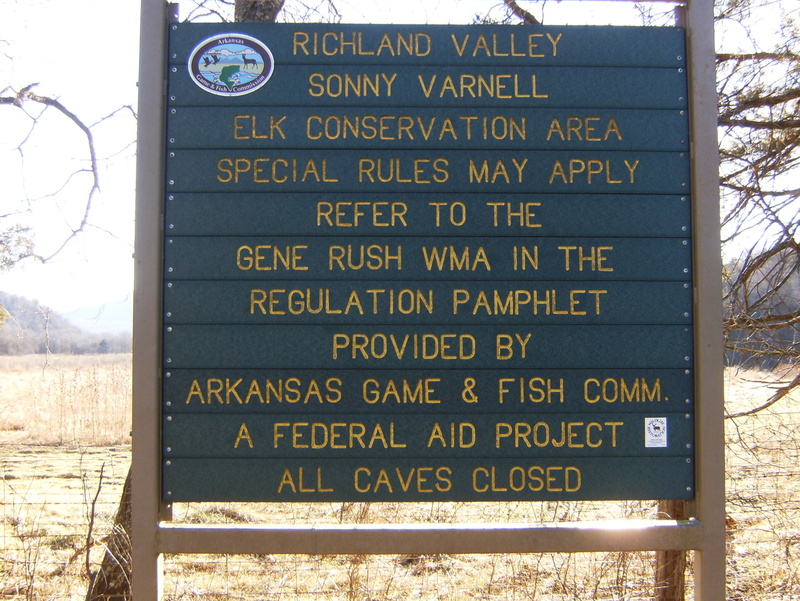 Access from the north requires fording the Buffalo River while coming in from the south requires an even deeper ford of Richland Creek. You’re not likely to hitch-hike to Wollum! 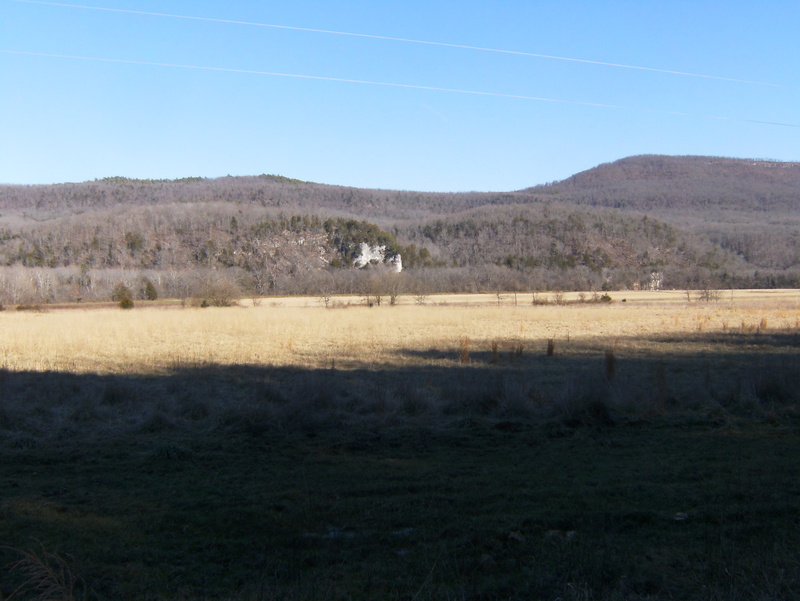 The last 4 miles are on this road, with steep hills on your left and hay fields in the broad Richland Valley on your right and Point Peter Mountain beyond. These fields are now part of an Elk restoration area and are pretty much off-limits to us for any purpose. 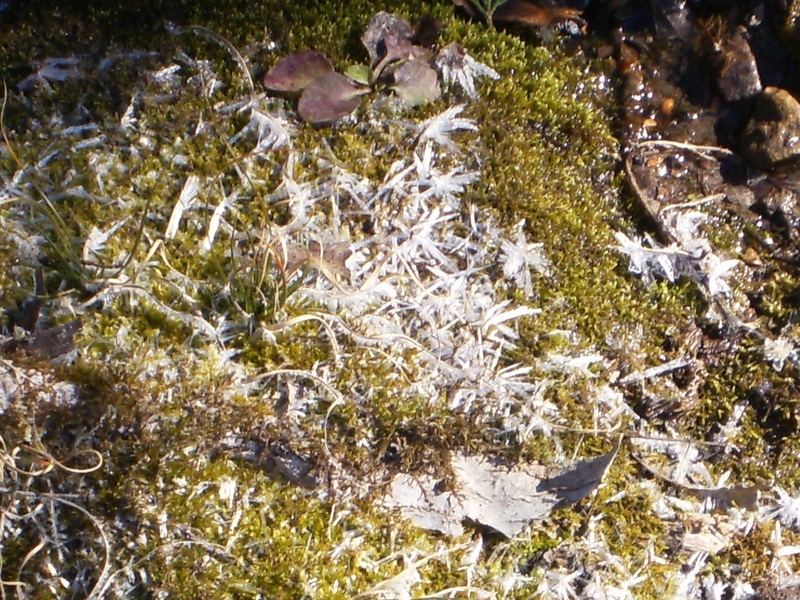 There are many places where you see animal tracks coming down the slope and crossing the road into the fields. Near the historical site of the town of Point Peter, mile 163, you can catch a glimpse of The Narrows a mile further up the road. And then there you are. 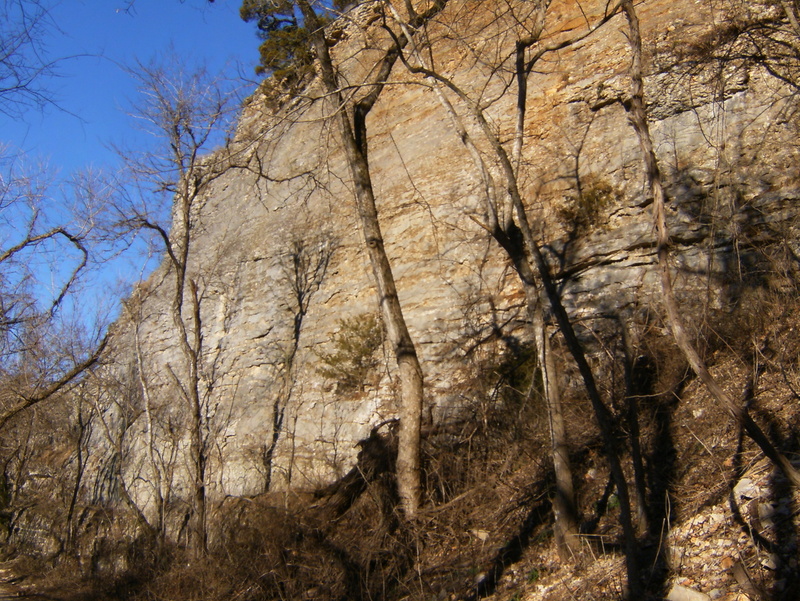 The Narrows, a narrow strand of rock carved on this side by Richland Creek (before the channel shifted) and on the other side by the Buffalo River (similar to The Pinnacles – a formation north of Columbia MO). I’d estimate the general height as 80-100 feet. There are ways to climb on top but that would have to wait until tomorrow – I’m a mile from the finish line and eager for the checkered flag. 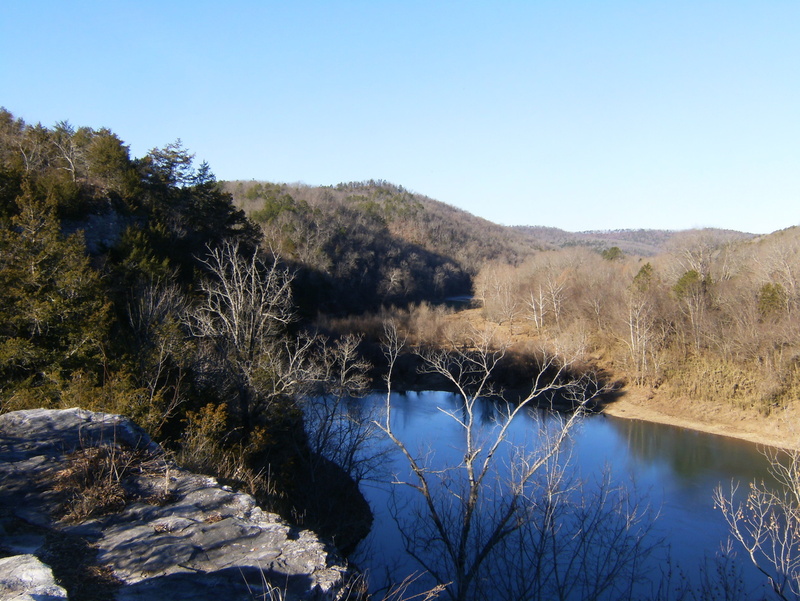 And there I am, at mile 165, looking across the Buffalo River toward the Wollum Campground. I was here a few weeks ago but this time my knees stayed dry. I took a few pictures and looked around a bit before turning back and finding a place to camp. The next morning I started heading south with a stop at The Narrows. Here, I’m on top looking at what is probably the narrowest of The Narrows. There are tails along the top though I doubt an end-to-end traverse is possible without some rock climbing skills. This has been a popular stopping point for decades for people floating the Buffalo and probably other day-trippers too. Like all of our other natural wonders, this one is now covered with trash. I got a bit further down the road and rounded a bend to see a few elk looking at me. As soon as we made eye contact they bolted up into the woods and I could see through the trees perhaps a couple dozen others also moving up and away. I was disappointed not to get a picture but still thrilled to see elk in the wild (I’m ignoring those Boxley elk that come out to pose for pictures every morning). 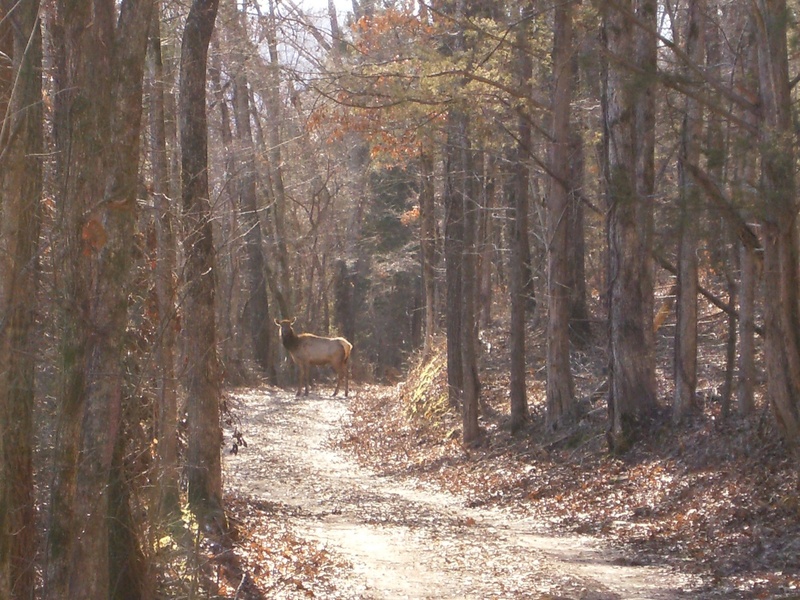 I had no idea if my crappy camera would be able to get a decent shot but it managed, and broke after taking this picture – the best of the bunch – moments before this elk joined its herd in the woods. I guess I’ve finally got an excuse to get a better small camera. 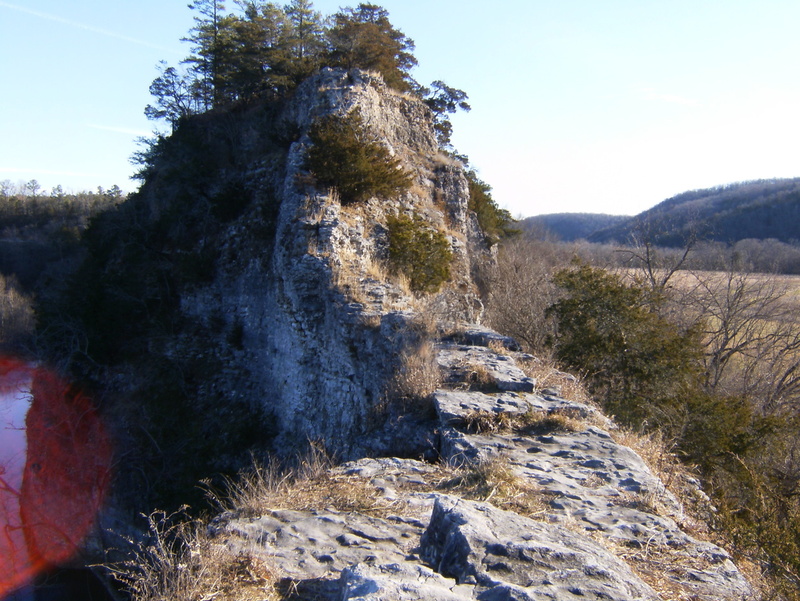 This entry was posted in Uncategorized and tagged Buffalo River Area, Hiking, Ozark Highlands Trail. Bookmark the permalink. Congrats on your completion and thanks for sharing it with us! Thanks, and you’re welcome! I hope you’ll leave the frozen tundra for a trip down here in the spring.